Case in point No. 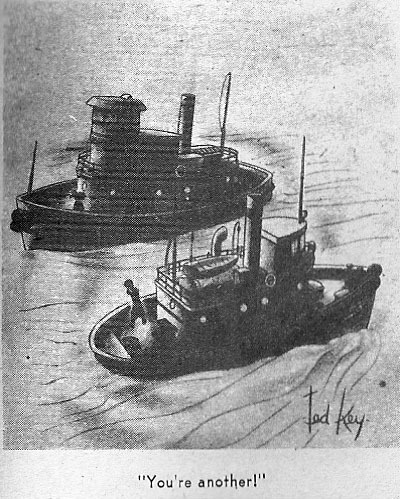 3 in this ongoing feature is venerable cartoonist Ted Key (born in 1912 and currently living in Pennsylvania). 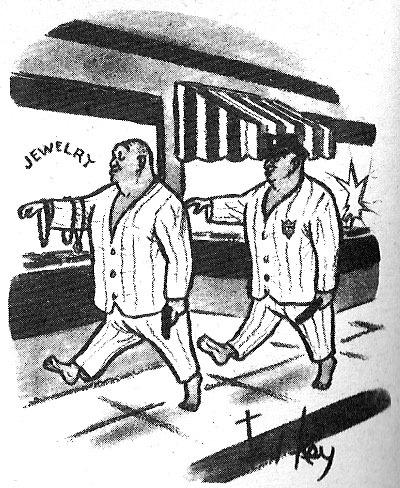 These early cartoons of his are from the same hardcover anthology I cited before: "The Good Humor Book", published in 1944. Ted Key was the creator of the irrepressible maid/housekeeper, Hazel. The "Hazel" panel was a weekly feature on the back page of the Saturday Evening Post for several decades. It also morphed into a popular TV sitcom, starring Shirley Booth. In 1969, when SEP folded (to be reincarnated later, under new ownership), "Hazel" was picked up as a newspaper panel by King Features Syndicate, and I believe it is still running to this day. 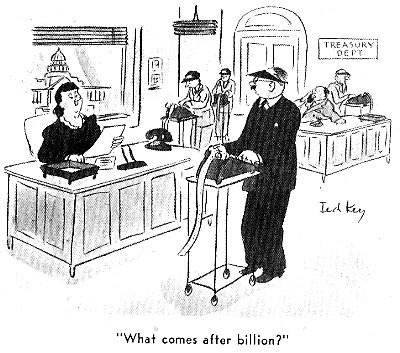 In addition to the "Hazel" panel, Ted Key was a prolific gag cartoonist. 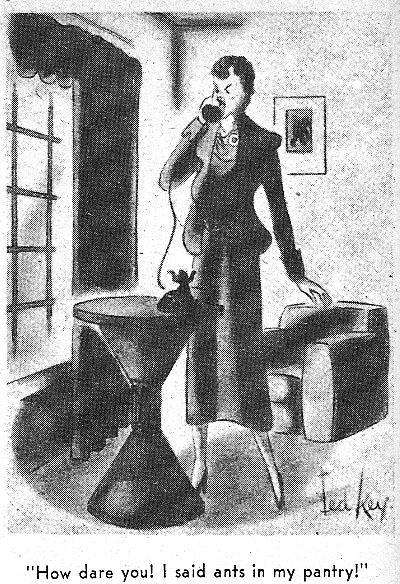 In his prime, most of his work appeared in SEP, but he was prominently featured in many of the other major cartoon-using publications, such as Collier's, Look and Good Housekeeping. In my opinion, none of these four early cartoons give any indication of the things to come in Ted Key's future. OK, I'll grant you that the woman behind the desk at the "Treasury Dept" looks a little bit like Hazel. What do you think? Remember, "we all have to start somewhere". Wow! Virtually unrecognizable to his later style. He really was going for a lush, almost painterly, wash effect. Ted Key is, as you rightly point out, alive and living in PA. No one I know has seen him in a long time, though.